This Bible belonged to, and was presumably made for, Robert de Bello (i.e. 'of Battle', near Hastings), who was abbot of the Benedictine abbey of St. Augustine, Canterbury, from 1224-53. He was clearly concerned to have an accurate text--it has been corrected carefully throughout--and his influence may be responsible for some of the very unusual imagery included among the initials. 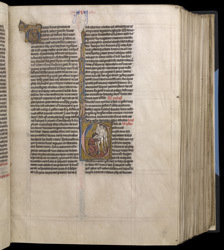 The subject-matter of this initial 'E' to the book of Josua is extremely unusual. It was probably inspired by the opening verse of Joshua 5:3, in which Joshua circumcises the Israelites who had been born after the Israelites fled from Egypt. The medieval artist represents this not simply as a historical event, but caricatures Josua as an ugly hook-nosed Jew.